The State Budget process is moving forward. We encourage you to take an active role and share your budget priorities with your legislators and with the Joint Finance Committee which plays a lead role in budget decisions. This is a great opportunity to talk about funding for special education, mental health services, transportation, the caregiver crisis, ending the waiting list for the Children’s Long Term Support Medicaid waiver, support for youth and adults with mental illness in the corrections system or youth justice system, and much more. The Joint Committee on Finance has announced their schedule for hearings on the budget. There will be 4 hearings around the state beginning on April 10th. Hearings will be held in Janesville (4/5), Oak Creek (4/10), River Falls (4/15), and Green Bay (4/24). Members of the public are invited to attend and speak about their priorities for the budget. Speakers are usually limited to two minutes; you may also submit written comments. Submit your comments on the budget for consideration by the Joint Finance Committee, email them to: budgetcomments@legis.wisconsin.gov. This is a great way to share your budget priorities if you are not able to attend a budget hearing, or if you do attend, you can submit your written comments so they are on record for legislators to consider. Stay in touch with your own state legislators and share your budget priorities. You can find your state legislators here. Consider sharing a personal story to explain why a budget proposal is important to you. 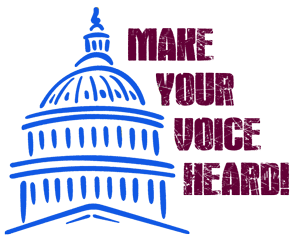 Your story can help legislators understand the impact of the budget on people with disabilities and their families. For those who like to get into the details of the budget, the Legislative Fiscal Bureau has released their analysis of the Governor budget proposal. You can read their budget papers here. Stay tuned for more information! DRW will be posting our overview of the Governor’s budget proposals for people with disabilities to help inform your budget advocacy.